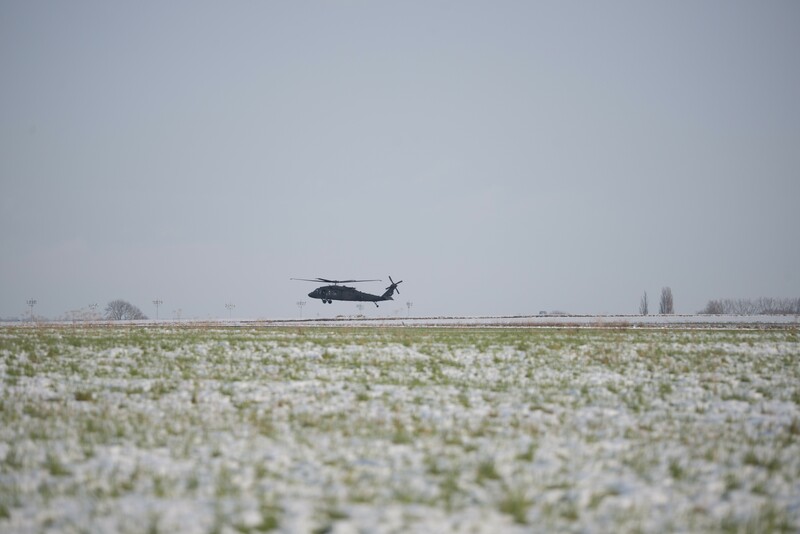 CHIÈVRES, Belgium -- Amid the snow and icy conditions, Chièvres Air Base, Belgium, became the intermediate staging area for 1st Combat Aviation Brigade as helicopters landed on SHAPE Air Field in late January and early February. 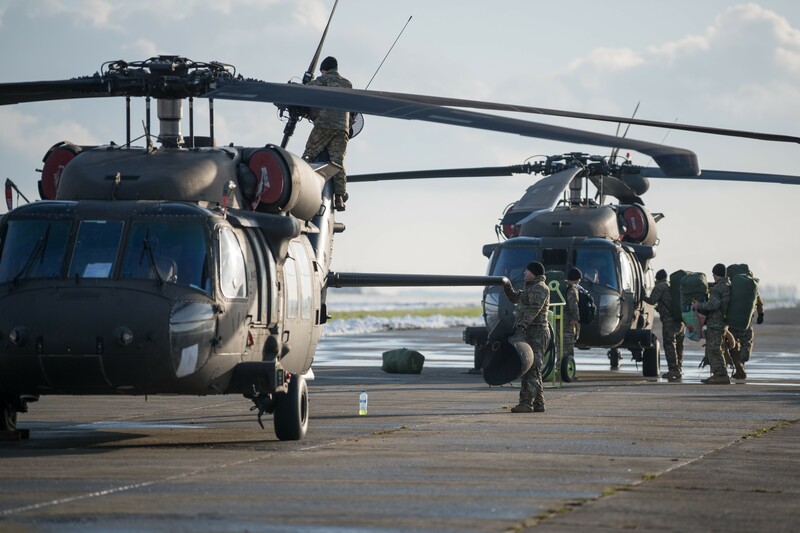 The 1st Infantry Division brigade, based out of Fort Riley, Kansas, are in the fourth iteration of a combat aviation brigade rotation in support of Atlantic Resolve, U.S. Army Europe and U.S. European Command. Aircraft, vehicles and equipment arrived by sea vessel in Zeebrugge, Belgium, during the last week of January, and then were moved to designated locations in Belgium. 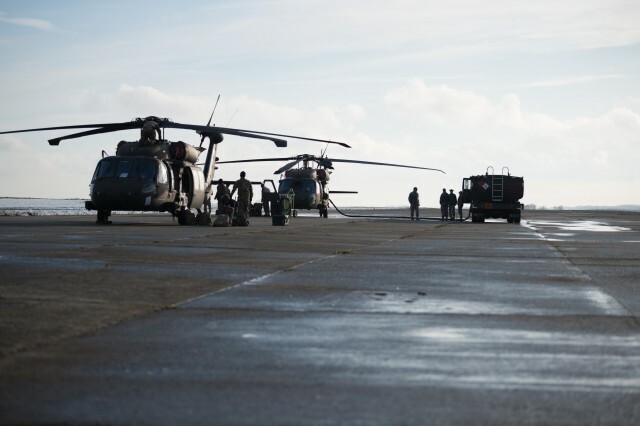 Chièvres Air Base, which was the intermediate staging area for the 1st Air Cavalry Brigade's deployment for Atlantic Resolve in 2017, was chosen for its capability to support the mission. "This airfield has the logistics support that we need to maintain, do test flights and build combat power," said Army Lt. Col. John Tiedeman, commander of the 3rd Assault Helicopter Battalion, 1st Aviation Regiment, 1st Combat Aviation Brigade. Personnel from the 424th Air Base Squadron, located on Chièvres Air Base, received the helicopters as well as provided ground services such as refueling and fire-and-rescue support. "We are demonstrating our joint contingency capability," said Air Force Maj. Timothy O'Rourke, director of operations for the 424th Air Base Squadron. The brigade felt welcomed by the local community. 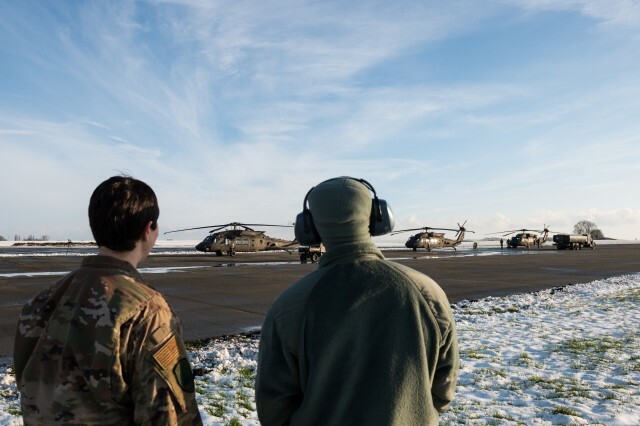 At Chièvres Air Base, which is a part of U.S. Army Garrison Benelux, garrison staff members were on-site to support the brigade's sustainment needs. "The garrison provides the sleeping areas, food and contract support," said Tiedeman. "They provide all the sustainment [needs] so we can focus on our main task, which is getting the helicopters ready to deploy." During the brigade's arrival, the local region experienced inclement weather as snow covered the grounds and created icy conditions. Garrison staff members ensured the base was operational with minimal delays. Notably, Directorate of Public Works employees cleared snow on the roads and made sure buildings were heated. Gate guards braved freezing temperatures to conduct installation access control. The 1st Combat Aviation Brigade will replace the 4th Combat Aviation Brigade, 4th Infantry Division, from Fort Carson, Colorado. Approximately 1,900 Soldiers will deploy for a nine-month rotation. According to Tiedeman, the Soldiers will be dispersed into Germany, Poland, Latvia and Romania. "Our long-term strategic partnerships are important to us as we reaffirm those alliances and we understand each other's different capabilities," said Tiedeman. "We look forward to the next nine months and getting out to the different NATO partners to conduct training, increasing our combat readiness and respond at a moment's notice to any threat to the NATO nations." For more information on Atlantic Resolve, follow #AtlanticResolve on social media or visit https://www.eur.army.mil/AtlanticResolve.